Anita's Notebook – Page 343 – Life is better with stories! One of my New Year’s resolutions this year is to make more YouTube videos. I love to put them together but it seems like I can never get as many done as I want. Why? I always think it’s going to be a lot harder than it actually is. I’ll get an idea in mind and then just let it sit there forever because I’m too intimidated to try. So I was sleepily browsing who knows what on the internet and stumbled on a site called Prelinger Archives. It’s basically a collection of old movies, ads, propaganda, and other derelict footage that probably would have just faded away otherwise. A lot of it is from the 40’s-50’s-60’s, which really clicked with me since I’d been watching a lot of TCM at the time. I started to think about maybe doing a YouTube video that would include some of that footage. Whenever I was listening to my iPod I kept an eye out (ear open? mind…well whatever) for a song that might work with something from Prelinger. ‘They Won’t Have Me’ by The Indigo Girls with all it’s imagery of old farmers and new subdivisions seemed like it would be fun to try. At first I wasn’t sure if it would actually pan out but it turned out to be pretty easy. A few minutes of searching came up with all sorts of footage of farms, farmers, suburbia, and even the Subdivision Man lol. Awesome. Fast forward to a week later and the video was done. So yeah, no more procrastinating when I get inspired. If I get dismotivated I’ll just keep in mind how easily the ‘They Won’t Have Me’ video came together. This is the story of what happened after Jody died. It’s meant for those of you out there who don’t live in AK or might not know the whole thing for some reason. I know that Jennifer and I have dropped off the radar for a long time and are still not in back touch with a lot of people yet. It’s not personal I promise. We still love you, times are just tough right now. 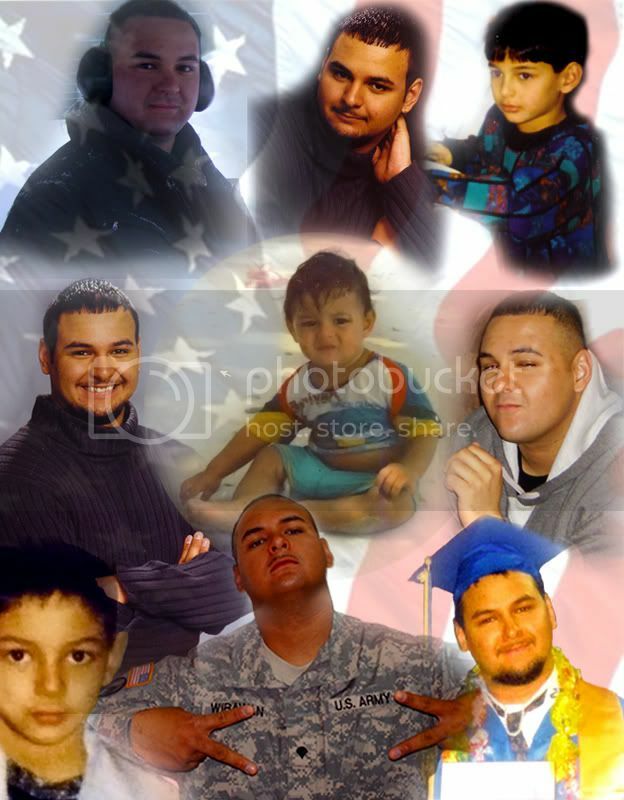 Jody’s time with the Army was up and he was set to leave Texas in September. He was going to come live with Jennifer and I for a while until he found an apartment and got everything set up. He was getting here just in time for my birthday. We were really excited and got to the airport early to wait for his flight to come in. Hours went by but he never walked through the gate. We called and called but the only answer we got was At&T saying that the number was unavailable. Or something. I just remember looking at my phone and wondering why we hadn’t heard anything. When we asked the lady at the counter she said that there was no record of a Jody Wirawan boarding any flights. We went home and stayed up as long as we could. Kept calling. Nothing. The next morning Jennifer was sitting at her computer and asked me to sit down next to her. She looked stricken and sick and I just *knew* that she was going to tell me that Jody had been in a car accident. And he was in the hospital. Or something. And then we’d fly down and be with him until he recovered. And take him back to Alaska to live with us. But Jennifer said that Jody had died. There had been a fight at his apartment and at the end of it he had shot another soldier and then turned the gun on himself. He had already been dead for three days. 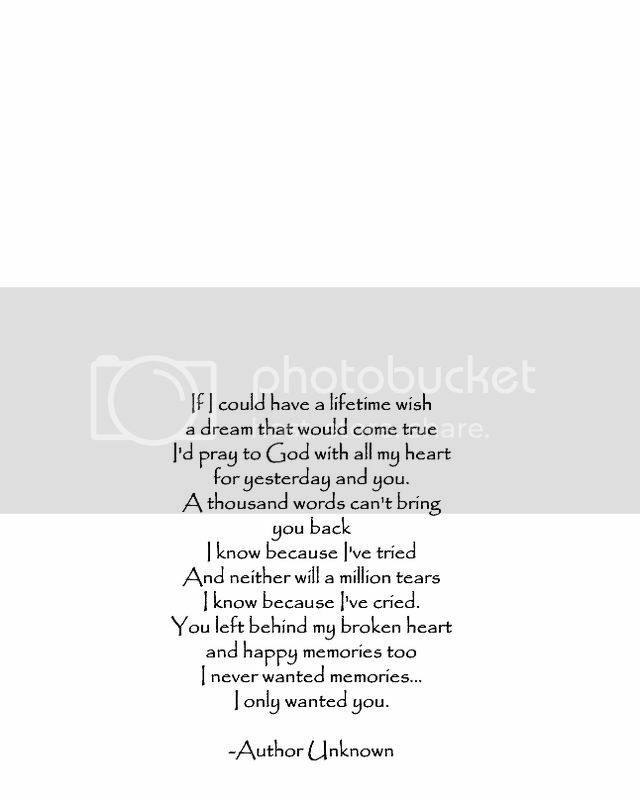 How do you tell a loved one something like this? She was sensitive and caring and loving. She held me while I just sat there in disbelief because that didn’t sound at all like Jody. But it was his name in the article on Google News. Why didn’t the Army call me? They said my name was on the list but my contact information was put in wrong. I got assigned a casualty officer with a voice that was cold and crisp. She chided me when I called on a Friday asking if there was any news on when the funeral would be. I was worried because by that point it had been weeks but I’d heard nothing from anybody. There’s no need to call, we’ll let you know when a funeral is set, she said. End of conversation. But later that same day she called and said she’d decided to check into it after all and that the funeral was Tuesday morning. Jennifer and I had to hurry and fly out in the next two days or we’d miss it. The funeral was a tragedy. 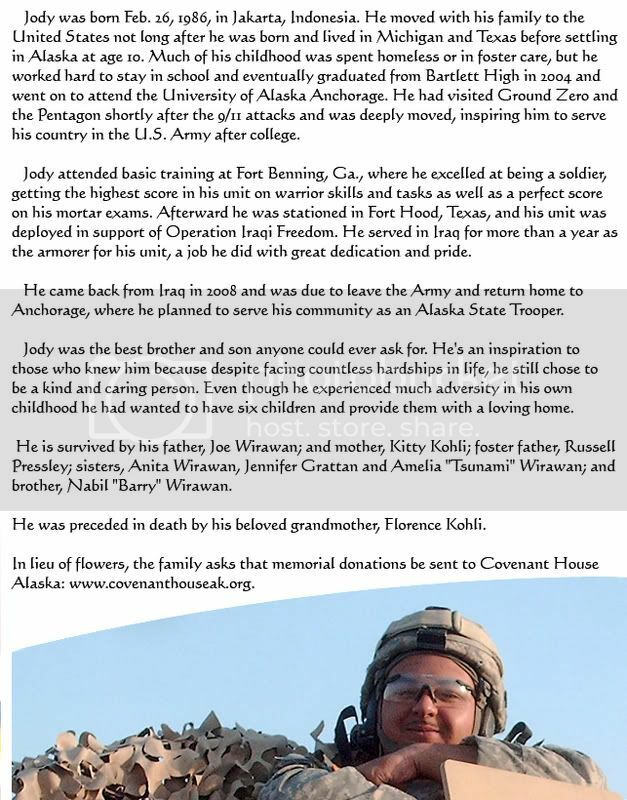 Other than Jennifer and I none of Jody’s friends/family from Alaska could get to his funeral on such short notice. So Jennifer, Jody’s foster Dad (Russ), and I held a memorial for him here in Anchorage. We decided to have it up at UAA since that’s where Jody went to school and where Russ teaches. We all scrambled to get everything together fast since there were a lot of people who hadn’t had a chance to say their goodbyes yet. I had a really hard time writing the eulogy. Jody had suffered so much tragedy and abuse in his life that I didn’t know how to talk about it without completely overshadowning who he was. The more I wrote the more I got wrapped up in all the sadness of what he went through. By the morning of the memorial I had barely slept in days. I sat in front of the computer looking at a eulogy that wasn’t fit to be read at a memorial. Jody deserved something that honored how he lived and I felt like I’d let him down. I was crushed, there was no way I would finish the eulogy in time. At this point Jennifer did an intervention and made me step away from the computer. She said that I needed to get some rest since I was very sleep deprived and not in my right mind anymore. You’re not getting anywhere anyway so you might as well get some rest, she said. I’d like to start off by saying thank you all for being here today. I’m not sure how to express how happy I am to be surrounded by so many people who have come to honor and celebrate Jody’s life. I know that you and I might not know each other and we might not have even met before this afternoon. But you’re here because you care about Jody and so to me that makes us family. 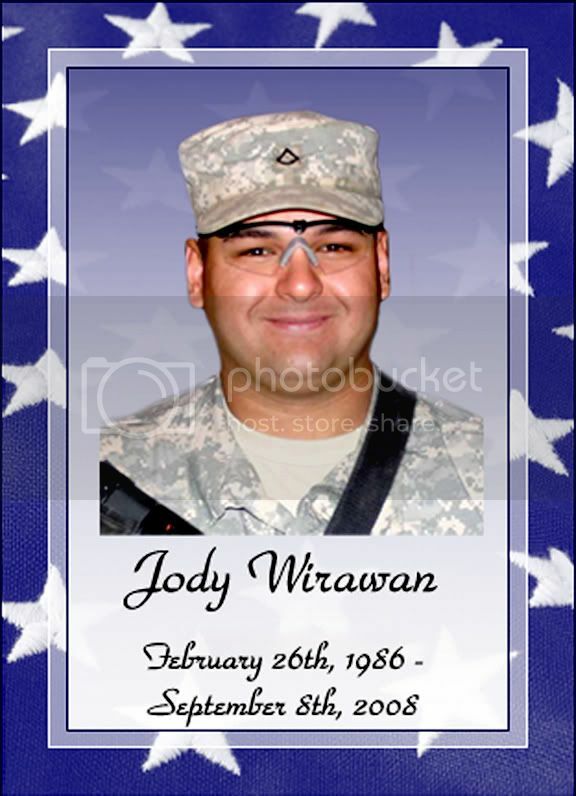 It’s become clear to me that words can’t adequately describe the meaning and value of Jody’s short life. And when I think about everything he had to go through over the years it makes me want to be bitter at the injustice of it. But that’s not how Jody lived his life. He faced so much adversity but he still chose not to be bitter. He chose to have a good heart and I want to honor that. 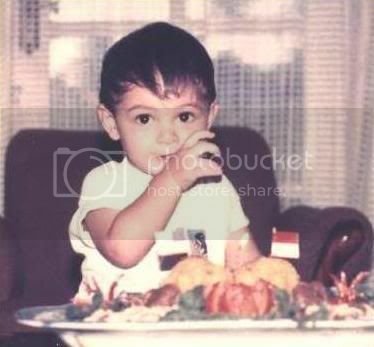 Jody Michael Wirawan was born on Wednesday, February 26th 1986 in Jakarta, Indonesia. At the time our parents were still together but their marriage was falling apart. They fought almost every night. And even though they had just had an adorably handsome baby boy, neither of them could keep it together long enough to give Jody the attention that he needed. Not long after Jody was born our parent’s marriage ended and Jody, Mom and I moved to the U.S. We lived in Michigan and Texas before coming to Alaska, the place he called home. Growing up I couldn’t have asked for a better little brother. I tried to teach him the important things in life: you know, like how to rollerblade and play baseball. Jody wasn’t real crazy about those things but he’d do them anyway because he knew that I liked them. His favorite thing was to play video games on the new Nintendo that Dad had just sent him. Jody would spend hours playing Mario Brothers and perfecting each level. A lot of times I’d play too and we would each take turns using the one controller. Even though I’d be more cautious than he would and take a lot more time, he was always patient and would wait his turn without complaining. Those were some of the best times in my life and I spent them with my little brother. He never lost that sense of compassion as he got older. As the years went on he was faced with more and more impossible situations but he continued to make the choice to be a good person. There were a lot of times in his life when food was scarce and he went hungry. But instead of becoming bitter about it he became someone who was more likely to share food with others. The last time I ever saw Jody he stayed at our house for a week, and the day before he left he came home with a bunch of grocery bags packed with food. He quietly went into the kitchen and stocked up our cupboards as a way of saying thank you for having him over. That was Jody. When I talk to people about my brother the one thing everyone seems to remember most is the way he walked…you know what I’m talking about all puffed out and proud of himself. And he should be. When I found out that Jody had joined the Army I was really worried at first. But after talking to him about his job and how proud he was of what he was doing I couldn’t help but smile. He told me that he’d visited Ground Zero and the Pentagon and had been moved by the experience. This was one of the things that made him want to join the Army. I told him that I was proud of him, and I still am. Jody had wanted to have a big family. A few months ago we were having dinner and he asked me how many kids I was planning on having. I said probably just two and then asked him if he ever thought about having kids. 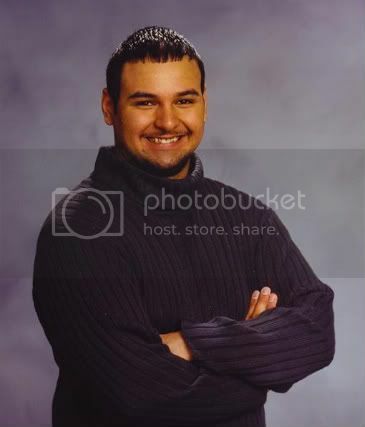 He puffed up his chest in that way that he does and proudly told me that he was planning on having six kids. I was really surprised and said well, that was a lot to take on and maybe he might want to try having ’em one at a time and see how it goes. He laughed but his mind was made up. He’d been thinking about it for a long time and wanted to have exactly six. When I asked him why, he said that he knew somebody who was a father to six kids and that it had inspired him. I thought it was amazing that he’d want to have any kids at all considering everything he’d been through in his own childhood. But that was Jody. He knew that a person wasn’t defined by the cards they were dealt in life, but by how they chose to live it. I was never so proud of him as when he said he wanted to have a big family and to give them a good life. I wish he would have had a chance to make his dream happen. Twenty-two is too young for anyone to die, but especially for someone who had survived so much and had wanted to do such good in the world. I love you too Jody. I made a video about Jody’s life for the end of the memorial. I wanted to tell his story in a way that was different than what could be done with words on a page. 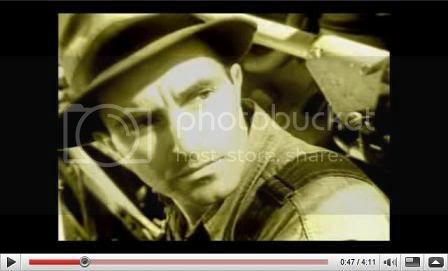 The images of Jody and the places he had lived spoke for themselves, so understanding which ones to use and how to put them together was pretty easy. But I had a really hard time deciding what song to go with. I mean, how do you decide on a single song to represent an entire lifetime of experiences? I went through so many songs. So. Many. Songs. As time went on it seemed more and more an impossible thing. After a while I just wanted to give up and settle for a standard memorial song, but none of them would have felt right in a video about Jody’s life. Finally I came across a song that was about a young man praying to God about the storms in life: Calm the seas in my life / So on you I can keep my eyes / Don’t let the storm roar / But don’t stop the rain so that I might grow. It was perfect. Here was something that spoke to the overwhelming amount of adversity that Jody had experienced in life. And all the faith he’d had despite everything. After the memorial came long days of reality sinking in. Jennifer and I had planned on giving Jody a big Thanksgiving, a table filled with more food than he could ever dream of eating. Anybody who knew Jody knew about his love for food, so this would be the best way to celebrate the start of a new chapter in his life. But that would never happen and instead of him there was only an empty chair at the table. It will be updated every so often with new cards, videos, pictures, and stories. I’m not sure what else to say right now. I miss him. Wikipedia Bio -A short history of Scotty Cranmer’s career. 23mag.com Bio -A timeline with interview excerpts and videos.